Extremely rare WWII map of Singapore using Japanese Occupation name Shonanto. 昭南島市街地圖 / Syonan-to City Street Map. [Singapore]. A very rare unrecorded variant of the 1942 WWII (World War II) map of Singapore City and island. This is notably one of the few maps to use the ephemeral Japanese Occupation (1942-1945) term for Singapore, 'Syonan-to' (昭南島 Shōnan-tō, Shonanto). Although the first edition of this map was issued in 1938, the present example dates to 1942, and was issued just after the February 15, 1942 Battle of Singapore, also known as the 'Fall of Singapore.' The Battle of Singapore was one of the most important Japanese victories in World War II and considered by Winston Churchill, the 'worst disaster' in British Military History. The map was doubtless published to capitalize on Japanese interest and activity in Singapore following the capture. This curious map is printed on both sides. The recto features a map of Singapore City, what is today generally referred to as the Downtown Core. It covers, roughly from Keppel Harbor to the Seaview Hotel and inland as far as modern day Newton. Streets and business are identified in both Japanese / Chinese and English. On the verso, the map details the island of Singapore, identified as Syonan-to. Notes provinces, roads, rail lines, and major topographical features. At sea, shipping likes are noted. The cartography for both maps (front and back) is derived from the F.M.S. (Federated Malay States) Surveys, hence the provenance of English terminology throughout. 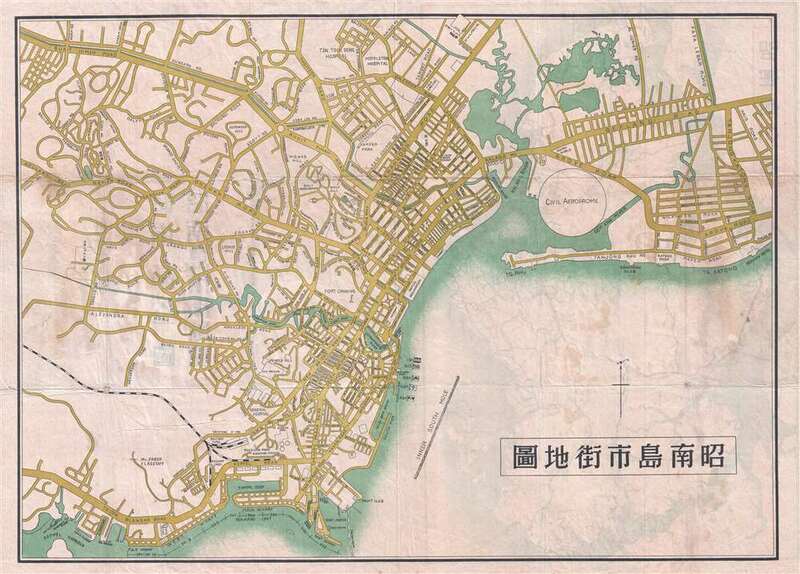 This map was initially published by the Singapore Japanese Club for its members in 1938, by the Dai Nippon Printing Company. There was also a 1942 second edition printed by the Arai Company of Japan. The present example corresponds to neither edition, and is, as far as we know, a rare unrecorded variant. The map has no imprint and lacks the business guide present on the Sinagpore Japanese Club editions. Although the Japanese Club editions do come to the market from time to time, we have not been able to identify another example of this edition anywhere. It is significant for its use of the ephemeral term, 'Syonan-to' (昭南島 Shōnan-tō, Shonanto) to identify the city. Very good. A few minor repairs and reinforcements along original fold lines. Even overall toning.